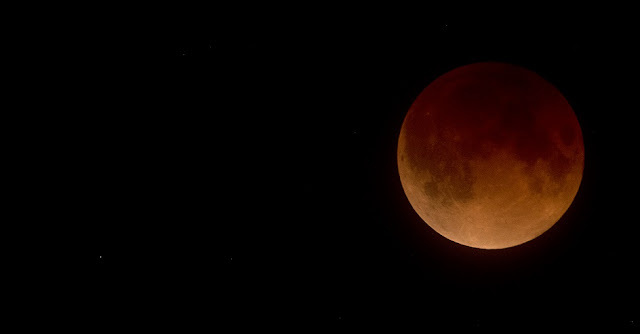 A rare lunar event being called the "super blue blood Moon" has dazzled skywatchers around the world on Wednesday, January 31 as the full Moon passed directly through the shadow of Earth, producing a total lunar eclipse. The shadowed Moon turned a coppery shade of orange visible in Asia, Australia and much of North America. The eclipse began around 11:45 GMT, as a black shadow began to devour one corner of the gray-white Moon. An hour later, the lunar surface was plunged into darkness, known as totality. Then, rusty tones began to sheath the Moon, reflecting the light of all the sunrises and sunsets on Earth at the same moment. Hawaii and Alaska had the best seats, along with the Canadian Yukon, Australia and Asia. The western U.S. also had good viewing, along with Russia. At the Griffith Observatory in Los Angeles, hundreds gathered on the lawn in the wee hours under clear skies. Traffic was backed up more than a mile around the observatory. Sky-gazers also lined the beach near the Santa Monica Pier, some snapping photos and others reclining in the sand, their faces turned upward. NASA lunar scientist Noah Petro said he was astonished — and thrilled — by all the attention and fuss. The total solar eclipse that swept across the U.S. in August contributed to Wednesday’s buzz, he noted. Missing out on the eclipse from his home in Virginia, he watched the event online Wednesday morning with his two children, ages 3 and 7. “I hope that people use this as an opportunity to dig in a little more and learn about our own planet, our wonderful sister planet, the moon, and the sun and all the other great objects in the solar system,” Petro said on his way to work at Goddard Space Flight Center in Greenbelt, Maryland. It was the first super blue blood moon since 1982. That combination won’t happen again until 2037. For those looking ahead, the next supermoon is in February, the next blue moon is in March and the next total lunar eclipse is in July, according to NASA.